At the Country Living Christmas Fair, I came across a lovely company called Beefayre. Beefayre sell a range of beautifully packaged skin care, candles and honey, pollen and propolis. At the Christmas Fair they were selling a special winter collection that smells perfectly Christmassy. 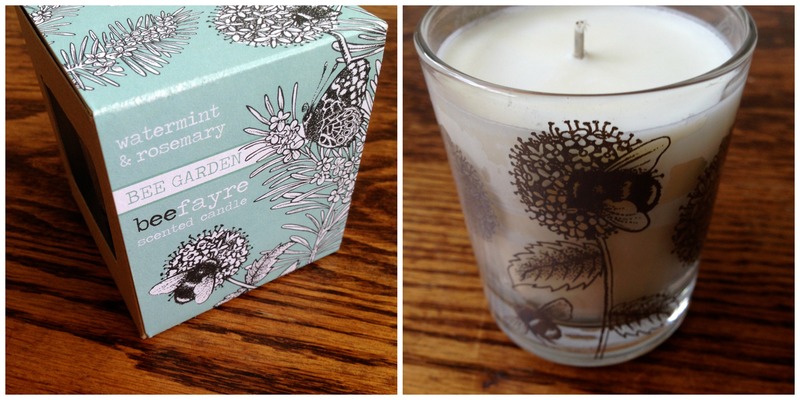 However, I decided to treat myself to a Bee Garden (Watermint & Rosemary) candle, which has a lovely delicate scent. I’m burning it to relax in the evening. Although, generally speaking, both mint and rosemary have an uplifting, energetic scent, this version is gentle and I’m really loving it. The UK produced candles are hand poured natural wax (no petrochemicals here), with a 50 hour burning time – and you can also use the warmed wax as a massage oil. I really loved the glass jar that the candle comes in, which will still be beautiful once the candle has finished, used either as a tumbler or with a tea light dropped into it. Different scents have difference images on the glass, so a collection together would look fabulous. The rest of the packaging is cardboard which can be composted or recycled, which is really pleasing to me, as I’m trying to reduce the amount of waste we produce at home. As well as being beautiful products, free from nasties like parabens and sulphates, the company also give 3% of all profit to bee conservation and research too, and are supporting a great collection of charities such as Buglife. I can really see it becoming a favourite brand for me and I really recommend you take a look, as all their products would make Christmas gifts too. PS: On a recent visit to a wonderful local store, Chirpy, I saw they were stocking the aforementioned Christmas candles – so I might treat our home to a few for the festive season too!